Every home or business owner thinks about the security of his valuables at some point. This is where the option of owning a safe comes in, but the number choices may seem overwhelming to some. Choosing the best fire and waterproof safe is no easy task due to their sheer numbers, but there is a handful that can be worthy of the “best” title. After meticulously evaluating various features and customer’s experiences, a list with the top safes may be constructed for your benefit. 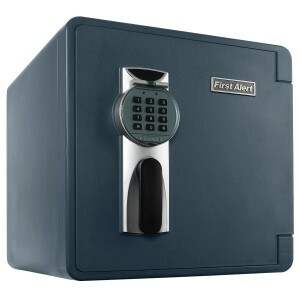 This safe is certainly one of the top choices for ensuring the security of your valuables. Its characteristics and features make this safe an excellent purchase as the client receives great value when compared to the price. It may have one or two minor issues, but they do not have any impact on security whatsoever. 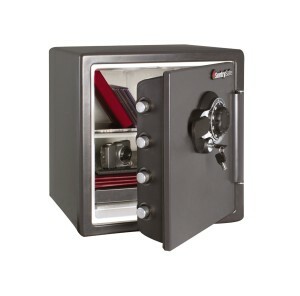 This is a 93-pound heavy safe constructed using thick steel and cement to ensure strength and durability against various possible hazards as well as robbers. This solid safe features 4 live door bolts ensuring a solid construction and pry-resistant concealed hinges to discourage potential thieves and robbers. The safe comes with a digital backlit keypad that allows the user to easily change the combination to the safe. Programming the code takes mere seconds and in case the user forgets the combination, he may use the provided manual override key. Its design guarantees a 1-hour resistance to fires that exceed the temperature of 1700F. A waterproof seal that guarantees to prevents documents and valuable from being affected by water. Manual override key in case the combination to the safe is forgotten by its owner. Adjustable shelves for the user to organize the safe according to personal need. The 1.23 cubic feet SentrySafe certainly ranks as one of the top water and fireproof safes available on the market. 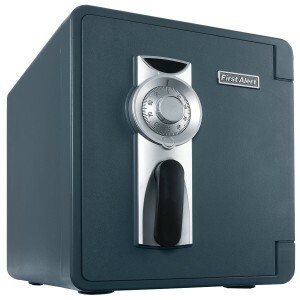 After analyzing the safe’s design specs and the experiences coming from the users, it is safe to say that this is a well-constructed product worth its price tag. Here are the features and characteristics that make the SentrySafe a quality fire and waterproof product. Solid construction that offers strong fire and water resistance and features 4 1-inch large live locking steel bolts and a pry-resistant concealed hinge bar. Dual combination lock with key to further add to the security. Protected against fire temperature up to 1700˚ F for 1 hour. Verified as waterproof up to 8″ for 24 hours. Included bolt-down kit that enables the user to bolt the safe to the floor, thus preventing robbers from taking the safe. It also provides the user with a multi-position shelf for customizable organization. This product is praised for being one of the safest fire and waterproof safe in its category. After analyzing customer reviews and the safe’s own features, a conclusion as to why this is one of the best safes can be easily drawn below. Solid construction that features 4 live-locking bolts. Verified to secure electronic storage devices such as CDs, external hard drives and memory drivers in a fire for 1 hour at 1700˚ F.
Waterproof seal that will keep your valuables dry. Emergency override key in case the user forgets the combination. Adjustable interior to be customized for the client’s specific needs. 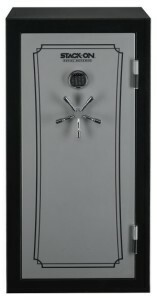 Stack-On’s fully convertible total defense safe is revealed to be one of the best fire and waterproof safes. Its features and qualities assure complete safety while also allowing the buyer to customize it for various purposes. Below are the reasons why this product can’t be easily matched on its market. Rock solid construction that features 8 locking points (5 live action bolts and the 3 dead bolts). Easy to use electronic lock. Fireproof for 75 minutes at 1400˚ F.
Waterproof at up to 2 feet of water for 72 hours. It also boasts adjustable barrel rests, making it possible for the client to store tactical weapons that require specific spaces. Has the capacity to store 28 firearms.